Academy because I couldn’t decide which engineering discipline I liked best. After serving in the Air Force for a few years and being afforded the opportunity to attend MIT to earn my master’s degree, I knew I wanted to specialize in aeronautics and astronautics engineering to best align with my career in the Air Force. College of the Armed Forces in 1994. She is also a graduate of the Air Command and Staff College. Her awards and decorations include the Legion of Merit and the Meritorious Service Medal. 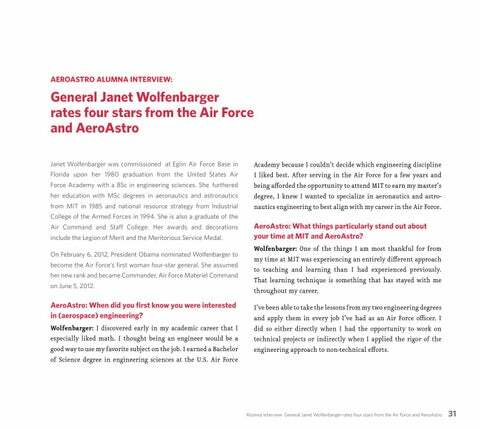 On February 6, 2012, President Obama nominated Wolfenbarger to become the Air Force’s first woman four-star general. She assumed her new rank and became Commander, Air Force Materiel Command on June 5, 2012. AeroAstro: What things particularly stand out about your time at MIT and AeroAstro? Wolfenbarger: One of the things I am most thankful for from my time at MIT was experiencing an entirely different approach to teaching and learning than I had experienced previously. That learning technique is something that has stayed with me throughout my career. I’ve been able to take the lessons from my two engineering degrees and apply them in every job I’ve had as an Air Force officer. I did so either directly when I had the opportunity to work on technical projects or indirectly when I applied the rigor of the engineering approach to non-technical efforts.